We offer a wide selection of contact lenses in Jersey City including disposable soft contact, bifocal/multifocal, toric, and colored lenses. Whether you wear daily, weekly or monthly disposables, or conventional (vial) lenses, check out our selection of lenses that fit your needs. A good contact lens fit starts with a thorough eye exam at our Jersey City office to ensure the most up-to-date prescription and rule out any pre-existing conditions that could interfere with contact lens wear. We will determine the best fitting lens based on your lifestyle needs as well as the shape and health of your eye. In most cases, you’ll have the opportunity to try lenses on the same day as your exam. You can even go home with a few samples before making a final decision. Schedule an appointment with Dr. Alice Chen today! Contacts not your thing? Ask us about our collection of LensCrafters Eyewear! If you need correction for presbyopia but dislike the idea of bifocal eyeglasses, you have many contact lens options in Jersey City, NJ. These rigid lenses aren’t as popular or well-known as soft lenses, but they offer the advantages of durability, crisp vision and high oxygen permeability. 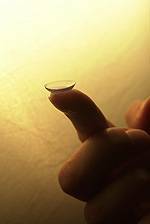 Stop in to our Edgewater, NJ office for more on these lenses. Challenges such as astigmatism, presbyopia, keratoconus and dry eyes needn’t be a barrier to contact lens wear, but they do require more time and patience. Give us a call at Citilight Optometry and we'll clarify it for you.